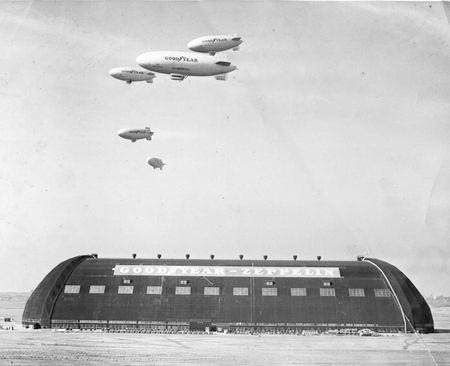 Following World War II, the Goodyear Zeppelin Company continued to manufacture airships, but it also expanded into producing other types of aircraft and aircraft parts. The main thrust of the company, however, remained the airships. The company now used the airships almost exclusively for advertising purposes. In 1966, the firm created the "Skytacular," a four-color sign that could be flown from blimps and read especially at night by people on the ground. Beginning in the 1950s, the Goodyear airships commonly appeared at major sporting events. The firm manufactured over three hundred zeppelins between 1923 and 1995, but it currently only operates four airships in the United States.